Myth #22 – The grass is greener on the other side. Statistically about 50% of all marriages end in divorce. The causes are many and varied but for the most part, infidelity, alcohol and substance abuse, and financial stress are some of the leading causes. In Bermuda, as in the United Kingdom, the only ground for divorce is the irretrievable breakdown of the marriage. Our legislation, however, only permits you to prove the irretrievable breakdown based on a set number of factual scenarios. The main ones are adultery, unreasonable behaviour, separation for two years with consent and if no consent is forthcoming, separation for five years. Irrespective of which fact scenario you rely on, the ultimate test is whether or not your marriage has broken down irretrievably, which means that there is no hope or prospect for reconciliation. 1. In most marriages, the financial wealth is created after marriage by the efforts of one or both of the parties. On divorce that wealth, which is called the matrimonial property, will be divided 50/50, unless there is good reason for the Court to deviate from equality of division. If one or other of the parties has inherited wealth or has wealth which he or she brought into the marriage, that wealth, which is called non-matrimonial property, may also be subject to division between the parties. With non-matrimonial property, there is no presumption of the wealth being divided in any set percentage and in certain circumstances, the wealth may be retained by the party that inherited the wealth or brought it into the marriage. 2. As in the case of capital wealth, the Court will also consider the income of the parties and may distribute the income so that the standard of living after divorce is comparable for both spouses, which means that if there is not sufficient capital wealth for a clean break, the spouse with the greater income capacity will likely have to pay periodical payment to the other spouse, potentially until he or she remarries or dies. 3. You must also give due consideration to what will happen in relation to the children after a divorce. In most instances, parents will continue to share the custody of their children so that they will continue to have input into decisions regarding their children’s education, religion, place of residence and medical care. However, and bearing in mind that children are not luggage to be picked up and transported from home to home, in most instances the children will be placed in the care and control of one spouse and the other spouse will have access to them as agreed between the parties or as directed by the court. By the way, this is not because there is underlying discrimination in the court system as between fathers and mothers as some would have you believe, it is because children are people and are entitled to a residence that they can call home and the security that that instils in them. Needless to say, the spouse with the higher income will have to contribute towards the cost of maintaining the children, including a contribution to the cost of providing a home and all of the accoutrements of life for them. In short, after a divorce, you are likely have 50 per cent less capital; depending on the amount of matrimonial property available, you may also have to share some of your inherited or pre-owned wealth; you will have to share your income with your former spouse if you were the primary earner; you will share your children with your former spouse; and you will have to support your children, including making a contribution to the cost of maintaining a roof over their heads even if you are not the care and control parent. By the way, the above will likely apply whether the matrimonial property is in your own name or whether it is in a trust that you set up in the hope of shielding it from division in the unlikely event of divorce. Now I ask you….has your marriage broken down irretrievably or is there some hope of reconciliation? Your matrimonial attorney has a statutory obligation to enquire as to whether there is any hope for reconciliation and if there is, he or she should refer you to a marital counsellor who will be able to explore reconciliation so that you and your spouse can satisfy yourselves whether your marriage is capable of being put back on good footing. Marital counselling will involve both spouses making a good-faith effort to identify and confront the problems in the marriage, and work on solutions to rectify them. Some marriages are not capable of reconciliation but some are, so before throwing in the towel, bear in mind that the grass is not necessarily greener on the other side. 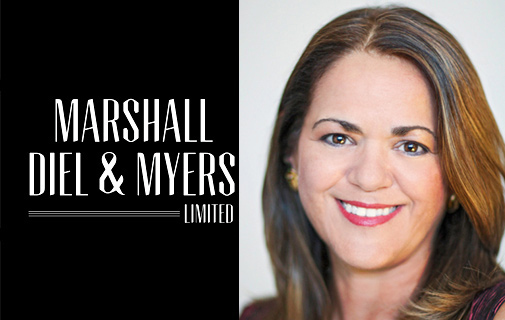 Finally, Marshall Diel & Myers Ltd, take this opportunity to thank the Bermuda Sun for giving us the opportunity to dispel some commonly held myths. We are sad to be saying goodbye. Georgia Marshall is a director of Marshall Diel & Myers Limited and Member of the Matrimonial & Family Team at Marshall Diel & Myers Limited. She may be contacted at georgia.marshall@law.bm or via phone at 1-441-295-7105 A copy of this article can be found at the firm’s website at www.law.bm. This column is for general guidance only and does not constitute legal advice.